Solar radiation is a general term for the visible and near visible (ultraviolet and near-infrared) electromagnetic radiation that is emitted by the Sun. It has a spectral, or wavelength, distribution that corresponds to different energy levels; short wavelength radiation has a higher energy than long-wavelength radiation. We can capture and convert solar radiation into useful forms of energy, such as heat and electricity, using a variety of technologies. The technical feasibility and economical operation of these technologies at a specific location depends on the available solar radiation or solar resource. Because the Earth is round, the Sun strikes the surface at different angles ranging from 0° (just above the horizon) to 90° (directly overhead). When the Sun's rays are vertical, the Earth's surface gets all the energy possible. The more slanted the Sun's rays are, the longer they travel through the atmosphere, becoming more scattered and diffuse. Because the Earth is round, the frigid polar regions never get a high sun, and because of the tilted axis of rotation, these areas receive no sun at all during part of the year. The 23.5° tilt in the Earth's axis of rotation is a more significant factor in determining the amount of sunlight striking the Earth at a particular location. Tilting results in longer days in the northern hemisphere from the spring (vernal) equinox to the fall (autumnal) equinox and longer days in the southern hemisphere during the other six months. Days and nights are both exactly 12 hours long on the equinoxes, which occur each year on or around March 23 and September 22. Countries like the United States, which lie in the middle latitudes, receive more solar energy in the summer not only because days are longer, but also because the Sun is nearly overhead. The Sun's rays are far more slanted during the shorter days of the winter months. Cities like Denver, Colorado, (near 40° latitude) receive nearly three times more solar energy in June than they do in December. This is called diffuse solar radiation or diffuse insolation. The solar radiation that reaches the Earth's surface without being diffused is called direct solar radiation or direct insolation. 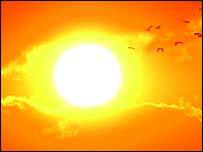 The sum of the diffuse and direct solar radiation is called global insolation. Atmospheric conditions can reduce direct beam radiation by 10% on clear, dry days and by 100% during thick, cloudy days. See also insolation. Scientists measure the amount of sunlight falling on specific locations at different times of the year. They then estimate the amount of sunlight falling on regions at the same latitude with similar climates. Measurements of solar energy are typically expressed as total radiation on a horizontal surface, or as total radiation on a surface tracking the sun. Radiation data for solar electric (photovoltaic) systems are often represented as kilowatt-hours per square meter (kWh/m2). Direct estimates of solar energy may also be expressed as watts per square meter (W/m2). Radiation data for solar water heating and space heating systems are usually represented in British thermal units per square foot (BTU/ft2).